We've been getting our share of cold, snowy weather. It's been better than last year, so far but winter is well and truly here. All photos were taken through glass -some through glass and screen. And some on different days. 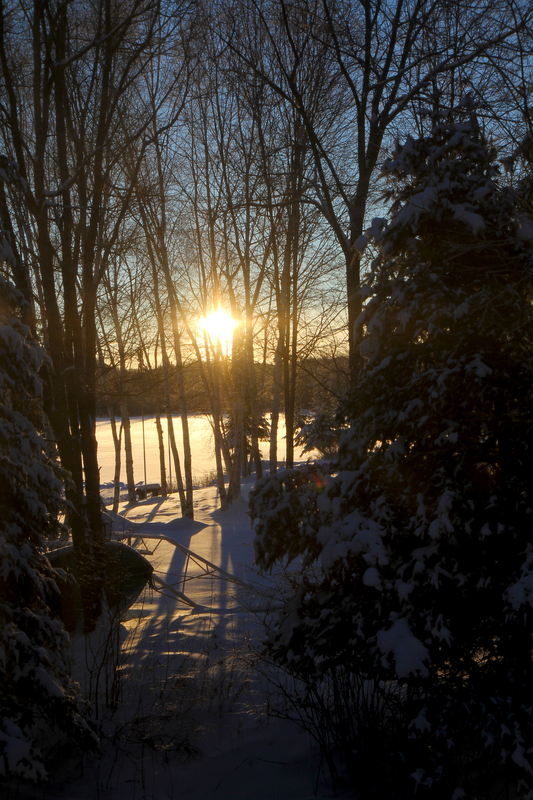 My first glimpse of the sun coming over Blueberry Island, as seen through my bathroom window. Turning to the opposite direction, you can see her lovely rays landing across the snow of our yard. Through the kitchen window, across the yard, across the road and up the hills on the opposite side, the trees collected frost and snow which lasted over tend days before we had a warming spell. And then the snow came in earnest. 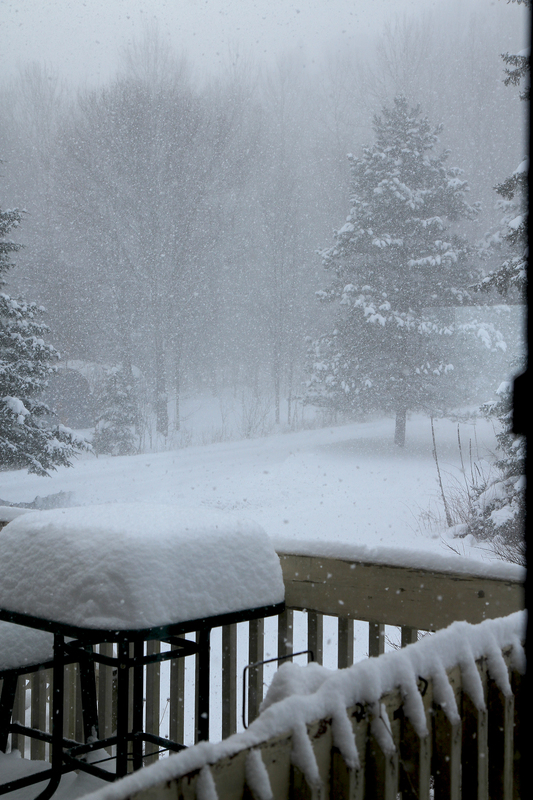 It continued to fall despite a few shoveling sessions. Eventually the sky began to clear and the vague warmth of sunshine tried to burn through. 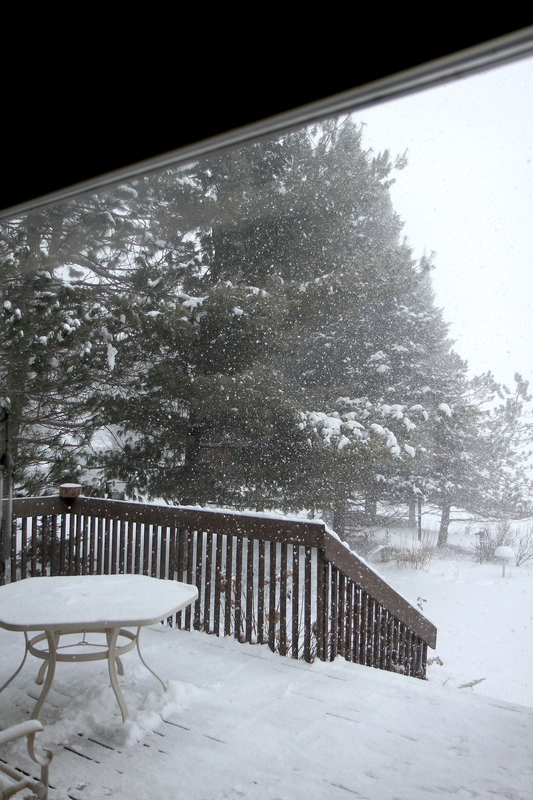 Despite that, it kept snowing for a while. The wind got creative - making icy patterns on the frozen, snowy lake. Sunset arrived with huge, cotton candy clouds. This is the view from my computer desk. I just lifted my camera over the monitor. 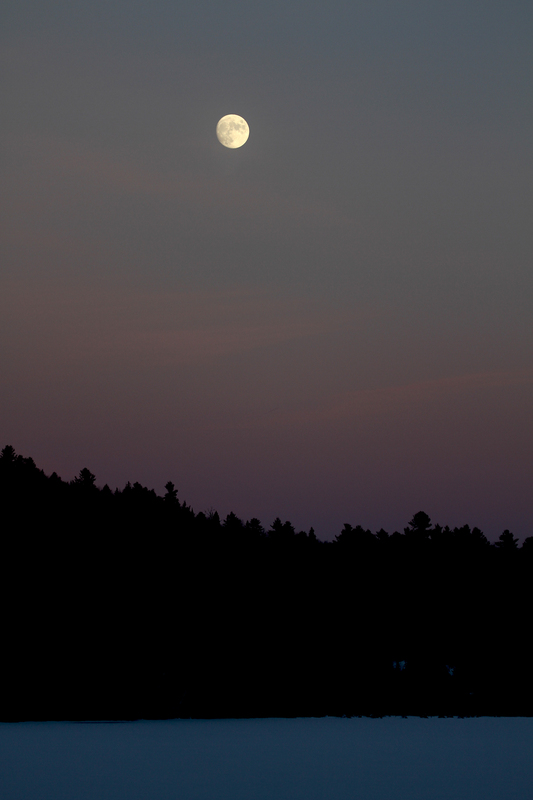 And not wishing to be out-pinked by the sun, the moon did her best to illuminate a lovely sky. Even for a summer person like me, it's difficult to not love a winter like that. Beautiful. The moon, the rising sun. I especially like the patterns made by the wind on the lake. Seems odd to me that I grew up in the snow for my first 32 years, but now can't imagine living in the snow. Looks so cold, yet so enticing. I love a good snow storm. So far not much in Jersey. Wonderful. I could live with these views. Beautiful! I'm glad Benny is okay. Wish we could trade views for a while. Winter storms can be real ugly but the after effect can add eye pleasing beauty to the countryside. A really beautiful snow series! 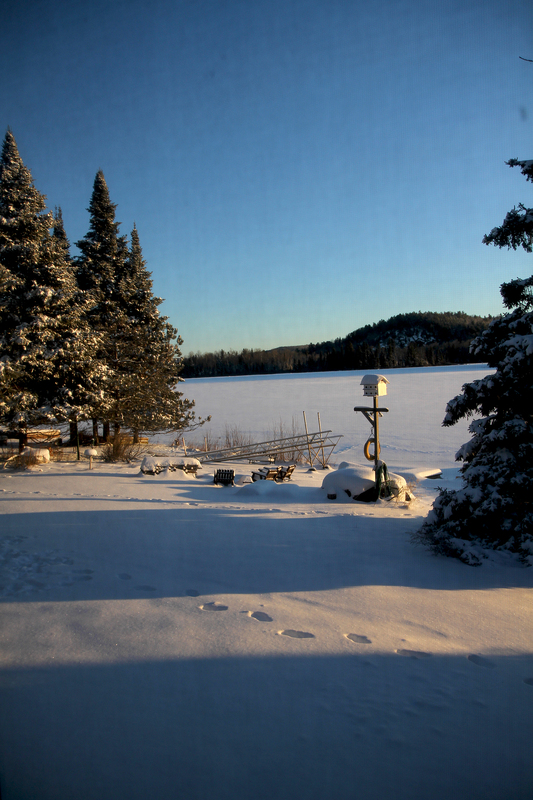 Your first couple of photos show the lovely light of winter, that is especially seen in the north country, where the light is low and the shadows long. This is the year that I know I am aging as I avoid going outside or driving somewhere unless I absolutely have to. Today the rainy is falling in sheets. the air is white with the falling water. You make it all look so pretty. 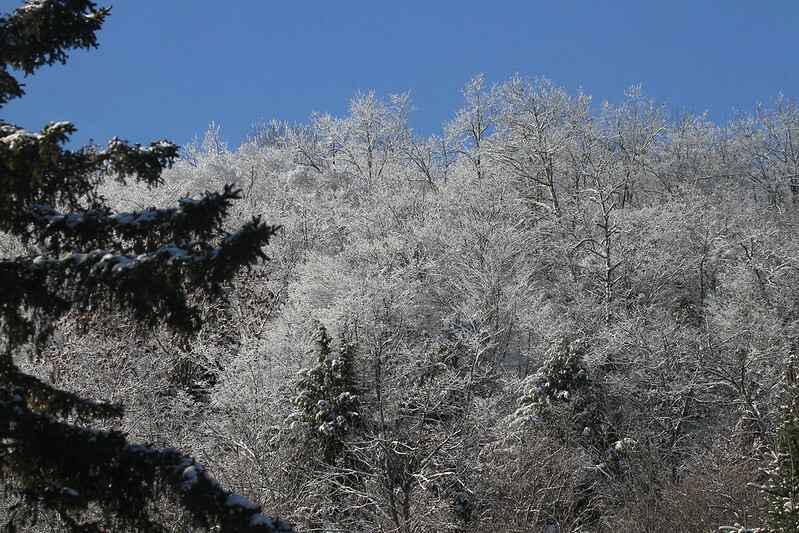 My favorite is the lacy ice-covered trees. When the trees and bushes look like that it reminds me of the fairy tale "The Twelve Dancing Princesses." Do you know it? Looks like a wonderful winter place. Your pix give a good impression of it. Very pretty, especially for one who doesn't have to shovel it. Truly i admire you, and your lovely photos. Three cheers for Benny! So relieved! You are living in a magical place! Wonderful to be able to look out of a window at those views. 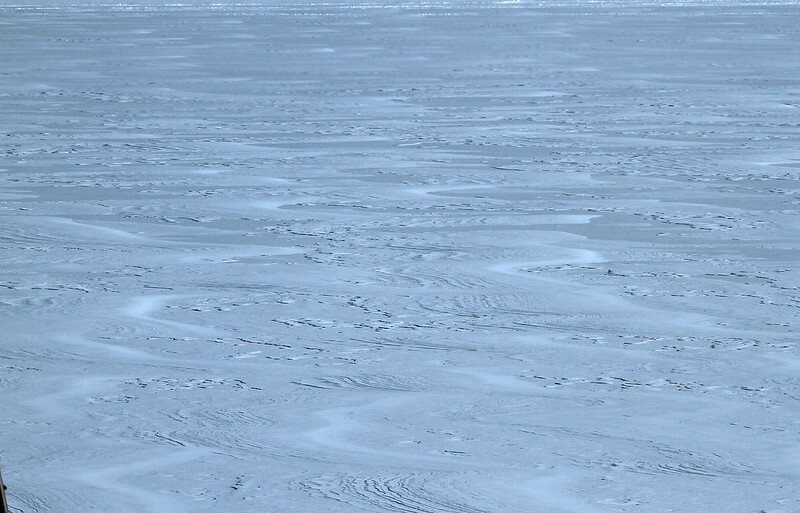 I love seeing the frozen lake and the patterns the wind makes. The snow and frost covered trees would be fantastic to see when the sun was out. Beautiful pics, Hilary. I especially like the falling snow. That can be tricky to photograph. The first photo is a keeper. It's awesome. You live in a very photogenic area and are making good use of it. Each photo a mesmerizing scene. outstanding images as usual. and still my favorite way to view snow. Oh, beautiful! How lucky you are to live among such natural riches (you know this). 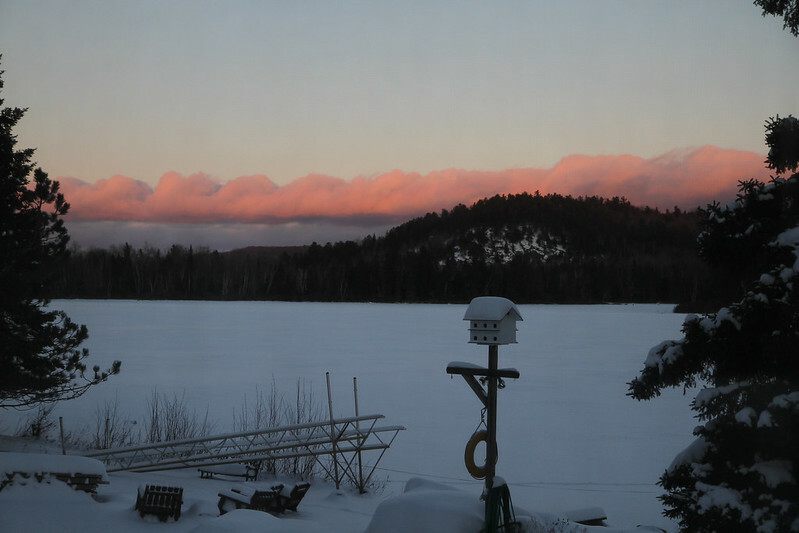 The moon, the snow, the clouds, the trees....sigh...the wind patterns on the lake are just so cool. Thank you. Gorgeous! I do love my snow! And thos pink clouds sure are beautiful! These photos show the beauty of winter.There is even beauty in a heavy snowfall. Gorgeous shots, and my kind of weather! Superb settings Hilary. I agree with you, the winter is a special time, but, I am looking, only looking. You have a gorgeous view. I am spellbound at the beauty! I like looking out of the window at the snowflakes falling, not so keen on it when I have to drive anywhere! Very little on the ground here atm, but I'm sure there's a big snowstorm in store for us in the not so distant future. That looks like some serious snow. I love the long shadows in that first shot. you have such lovely views! Sunrise is a special thing to have. my son has to rise over a forest and it takes a good long while, i live in a hollow. Picture(s) perfect! What an amazing celebration of your silent winter world. Those are all just so very beautiful, Hilary. It's much like that out here, though we haven't had any major snowstorms lately. See you in the spring. Blessings and Bear hugs! 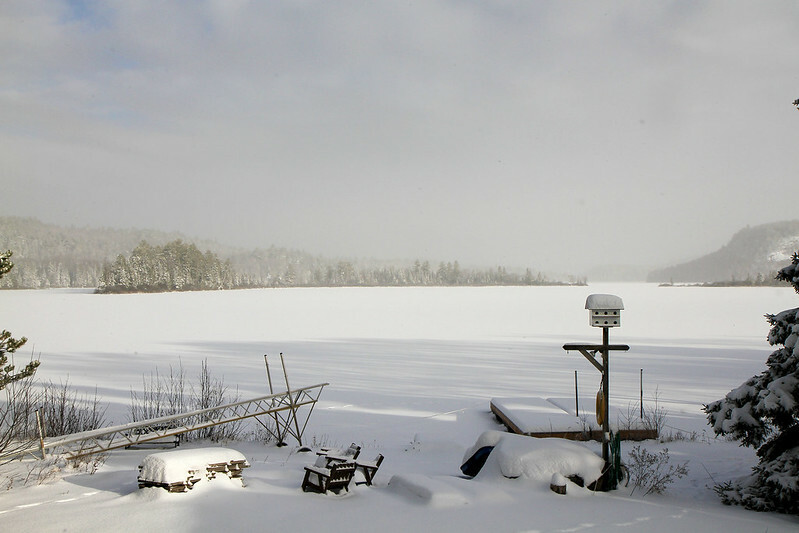 Love the pictures, especially the sunrise and the snow blizzard pics. They are fabulous! Looks like you have a gorgeous view from every room...including the bathroom! If I was somebody who never saw snow, your photos would make me want to take a trip just to experience that beauty! But since I have enough right here, I'll just enjoy your view! The snow is magical! Lovely pictures. OK, maybe not beautiful enough to prompt me to move from San Diego in the winter, but still, pretty darn spectacular. What an amazing view over your computer monitor. I think I would be staring out that window all day. Gorgeous Hilary. Wish we would get some rain for our drought stricken area. My trees and plants don't look so hot. I know it's winter but they do still need a drink now and then. It's gray and blah again today and I just can't get inspired. I am so tired of snow. That being said I was surprised to have such a great reaction to both of your snow photos. I really like the area where you live as the scenes you see are so good to see. Well you have some nice views wherever you are looking thru. After my recent experience of snow in Greece I have started loving it more. Great pics. Those of us that rarely see winter,except on TV, love a glimpse into your world. What breathtaking views you have from various vantage points. What a treat. However, cannot imagine it all in real life! Your photos are gawjus! We just got dumped on again last night. I wasn't expecting it. I didn't want it. But I must admit it is pretty. Beautiful pics! I love that first one and the way the light works itself in between the trees and falls on the snow. Lovely! What does Benny think of all that snow? Marvelous landscapes. The first one took my breath away. Speaking of photos...thank you for your comments on this B&W series I am working on. It's been a far harder thing than I anticipated. It looks so beautiful, but that's just me after a 70F day. Sorry! I do wish we had the opportunity for snow so I could get pics like this. Every ten years or so we'll have snow and it's always a treat. My dogs hate it and refuse to do business in it. Those shots of the falling snow are something straight out of a dream for me :) WOW!! Ahhhhh! Beautiful-- but I'm happy to be where there is no snow on the ground, at presen! I have been catching up on posts and was delighted to learn that sweet Bennie's tumors were benign. Good, good news! You must be so gloriously happy with your vista! Thanks for sharing it! The title is as appropriate as the photos are beautiful. Thanks. Hi Hilary, so to be slow in getting around. These are lovely. I so enjoy your winter pictures. The icy trees are gorgeous, as is the snowy sunrise. Thank you for sharing your winter with us. I'm amazed to see such lovely sun despite your cold, snowy weather. One of the not-so-wonderful things about where I live now: the many days where we are enveloped in fog and the sun is far beyond our gray world.